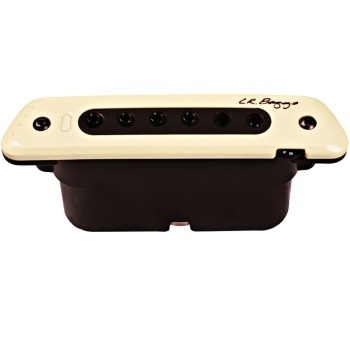 M80TM Magnetic Soundhole Pickup. More Body, More Soul. M80 Acoustic Guitar PickupThe soul of your guitar is in the body - from the tone woods that it's made of, to the fine details in the way it was put together. Standard magnetic pickups hear only dry strings, resulting in an "electric" sound that omits the true acoustic voice of your guitar. In contrast, the M80 hears the entire frequency range of the tone woods, thereby contributing warmth and complexity to your amplified sound. The secret of the M80 is a patented, free-floating humbucking coil that acts as a 3D body sensor. As the soundboard resonates in all 3 dimensions, a proprietary suspension allows each axis of the humbucking coil to respond with the guitar's movement. A resonate body signal is produced and blended with the strings to faithfully capture your guitar like no other magnetic pickup ever created. The M80 also gives you the choice of active or passive settings with the flick of the switch. The active setting engages a preamp with built-in EQ and audiophile circuitry for that "high-fidelity" sound Baggs is known for. Switch to the passive setting and bypass the preamp for a battery free performance. Other features of the M80 include a battery check, volume control and adjustable pole pieces for perfect balance between the strings.